Since his debut effort in 1996, True To Myself Eric Benét became one of the most famous American soul and R&B singers-songwriters of the 90's. Eric Benét Jordan, named after poet and author Stephen Vincent Benét, was born in 1970 in Milwaukee, Wisconsin, and continues to make his home there as an adult. Growing up in a household always filled with music, Benét, a self-taught musician, seemed destined to gravitate toward singing and songwriting. His other musical inspirations came from singing in church, as well as listening to the popular R&B artists of the 1960s and 1970s throughout his childhood. Together with his brother and two sisters, Benét displayed an interest in and obvious talent for music and harmonizing that would one day lead him to the top of the R&B charts. In the meantime, the aspiring singer, along with his sister Lisa and cousin George Nash, Jr., an accomplished guitarist, formed a band called Benét and released their first collection of songs in 1992 on EMI Records. However, because the label was in the midst of a corporate reorganization during the time, the album went largely unnoticed. Consequently, the group felt devastated by the blow, but Benét would soon realize that a series of tragic events would prove much more difficult for him to recover from than the failure of his group. Within an 18-month period in 1995, Benét witnessed his father's demise from cancer and endured the death of former girlfriend Tami. The young woman, also the mother of Benét's daughter India, born in 1992, suffered extensive injuries from a car accident and laid unconscious in a coma for five days until she finally passed away. Benét, torn apart emotionally by Tami's death, fell into a two-year depression. Only his daughter, at the time still a toddler, prevented him from giving up completely. Thus Benét, now a single parent, took on the responsibility of raising his daughter alone. With his music career on hold because of his mental state, he worked shifts at UPS (United Parcel Service) and helped local Milwaukee musicians record demos in the studio. Eventually, Benét started to write songs again, most of them reflecting on his recent experiences. Then, with the help of Nash and friend Demonte Posey, a keyboard player and programmer, he recorded a demo tape of three songs and sent them to Warner Brothers Records. Soon thereafter, Warner Brothers responded with an offer for a record contract. With his enthusiasm about music restored, Benét released his debut album, True to Myself, in 1996. The album, co-produced with Nash and Posey, drew on his childhood influences, early 1970s soul musicians like Al Green, Sly Stone, and Stevie Wonder. Nonetheless, Benét managed to blend his own contemporary artistry in with the forms he borrowed from his contemporaries, earning him critical recognition for his edgier take on R&B. Moreover, whereas most R&B artists usually adhere to one particular style of music, Benét also attempts to incorporate aspects of other genres into his songs as well. "They [other artists] kind of have the same vibe throughout the whole record. With my record, on one song, I might do something a little rocky, in another song I might do something kind of Beatleish and in another song, I might do something gospel/bluesy--it's kind of hard for people to take sometimes," Benét told the Philadelphia Tribune. The record's first single, "Spiritual Thang," became a top ten hit on the R&B charts, and the single "Let's Stay Together" was featured in the Martin Lawrence film A Thin Line Between Love and Hate. The album also included a song about his late girlfriend called "While You Were Here," which tallied up the aspects of their relationship taken for granted. Despite the success of Benét's first single, his debut effort lacked support in record sales. The young singer blamed some of the lower than expected numbers on the fact that his music did not fit in with the typical urban radio format. Nevertheless, even without the support of radio play, the determined singer forged ahead with a world tour to promote True to Myself, drawing fans into his music wherever he traveled. After completing his worldwide tour, Benét returned to Milwaukee to write new songs for a follow-up release. For this collection of work, he teamed with other talented writers and producers, in addition to Nash and Posey; the album featured the vocals of singer Tamia and collaborations with producers Wyclef Jean and Ali Shaheed from the rap/hip-hop group A Tribe Called Quest, as well as a duet with hip-hop artist Faith Evans for a remake of "Georgy Porgy" by the 1980s pop group Toto. After a year of arranging and recording music with producers, Benét released A Day In The Life in 1999, considered by critics as his best work to date. In addition, Warner Brothers witnessed a marked improvement in record sales over Benét's debut release. Benét himself felt A Day In The Life illustrated thathe had matured as a writer and performer, and said he took time to come up with the right body of work. The album, more grounded in classic R&B, was largely inspired by Benét's real life experiences. True To Myself , Warner Brothers Records, 1996. A Day In The Life , Warner Brothers Records, 1999. "Let's Stay Together," Warner Brothers Records, 1996. "Spiritual Thang," Warner Brothers Records, 1996. "True To Myself" (Maxi Single), Warner Brothers Records, 1996. "Georgy Porgy" (Maxi Single), Warner Alliance, 1999. "Spend My Life With You," Warner Alliance, 1999. 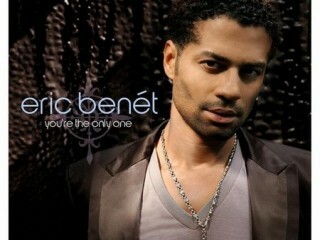 View the full website biography of Eric Benet.